Charlton Cheney Ferris was born in 1911, in Connecticut, the eldest son of Walter Ferris and Alice Cheney. He was the ninth great-grandson of Jeffrey Ferris through his son, Peter. Charlton was Yale, Class of 1934. That is where he met his future wife.He married Julia Salter in 1937. Julia was Yale ’32. In Nov. 1942, he joined the U.S. Navy as an Lieutenant JG. 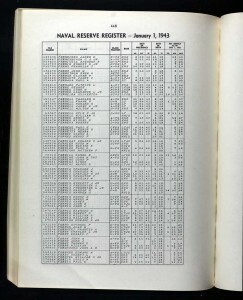 Navy Reserve Register for 1943 showing Charlton Cheney Ferris. Click on the image to enlarge. This newspaper clipping relates the World War II service of three Ferris brothers, Charlton, Stuart and Geoffrey. He commanded an LCI for the attacks on three islands, Saipan, Eniwetok and Guam. LCI stands for Landing Craft Infantry. The boat under Ferris’s command had been fitted as a gunboat, and was used to support the troop landings. He is listed as “LCI (FS) -438 Lieutenant C. C. Ferris, USNR” in the southern taskforce sent to the Marshall Islands. The FS stands for fire support. The LCIs were configured as gunboats LCI(G). Others were armed with rockets, LCI (R). The invasion of Eniwetok came first. The battles to seize the several smaller islands and the main island of the atoll took place from Feb. 17 to Feb. 23, 1944. Ferris was awarded a Bronze Star for his work in this battle. The next battle was for the island of Saipan. For his valor in this battle, Ferris would be awarded his first Silver Star. The battle for the island took place June 15 to July 9, 1944. On July 20, D+5, a group of barges sallied from the harbor of Tanapag, filled with Japanese troops and headed for the invasion beaches. The maneuver had been anticipated and the U.S. Navy was ready. Ferris’s boat was part of the ambush. The attack was routed with many losses on the part of the enemy. The number of barges is described as 13 in one source, and as 35 in another. The ambush was conducted by the destroyer Phelps, a host of LCI (G)s and Marine amtracks. 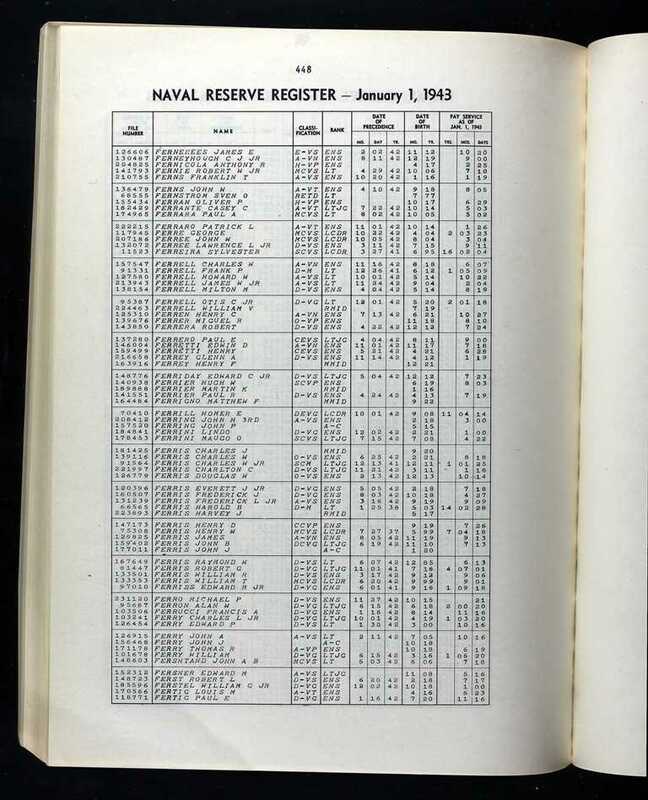 The Navy then moved to Guam, an American protectorate lost to the Japanese on Dec. 10, 1941. The battle for Guam took place Jul. 21 to Aug. 10, 1944. Ferris would be awarded his second Silver Star for his valor in providing fire support to the Marines in the landing force. 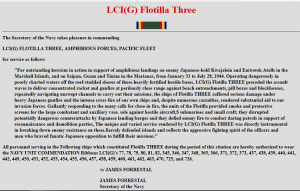 His unit, LCI(G) Flotilla THREE, received a Navy Unit Commendation for their “outstanding heroism in action” during the period January 31 to July 28, 1944. 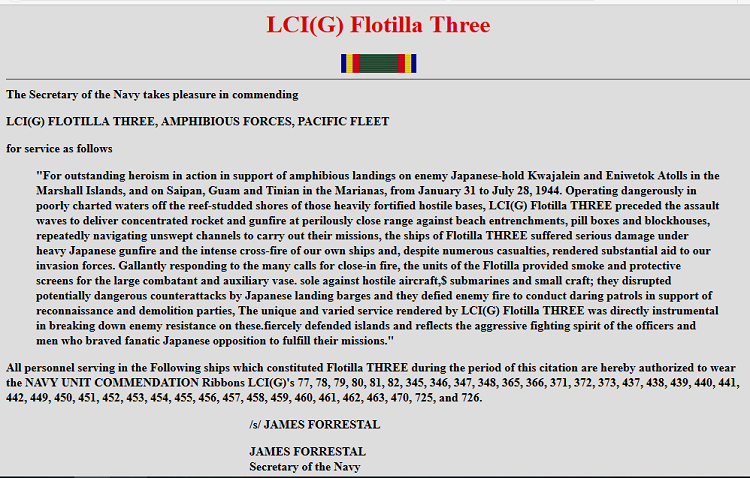 Navy Unit Commendation to LCI(G) Flotilla THREE for heroism in Pacific. Click on image to enlarge. LCI(G) 438, under a new commander, took part in the invasion of Iwo Jima. It was badly damaged by Japanese fire and took several casualties.